Alice Ivers was born in Devon to Irish immigrants and emigrated with her parents to Virginia when she was 12 years old. She attended boarding school there to become a refined young lady but in her late teens the family moved to Leadville, Colorado. There she met and married her first husband, Frank Duffield, an engineer and poker player. She was widowed after a few years of marriage and turned to palying poker professionally to support herself. She was very successful at this, and liked to blow her winnings on shopping sprees for clothes in big cities like New York. By 1890 she was a dealer in Deadwood, South Dakota, saloon and there she met and married her second husband Warren G Tubbs. They had 4 sons and 3 daughters together, and left their gambling ways behind them to rear the children in better surroundings. Warren died of pneumonia in 1910 and Alice once more returned to the poker tables. Alice was considered attractive even in her 50s, and she used this, and her fashionable way of dressing, to distract men at the tables. She again made a fortune at gambling and was arrested several times at her establishment, the 'Poker Palace', for being a madam, a gambler and a bootlegger. 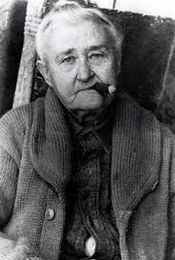 She was known to always carry a gun (a .38) and she often smoked cigars. This colourful lady married again and was widowed a third time in 1913. She died in 1930 in Rapid City, South Dakota, of complications following a gall bladder operation.